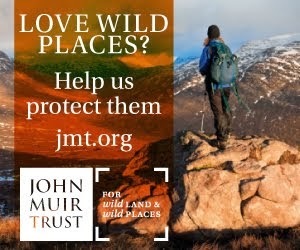 Recently the Mountaineering Council of Scotland issued a warning about the amount of snow still lying in the Scottish hills. 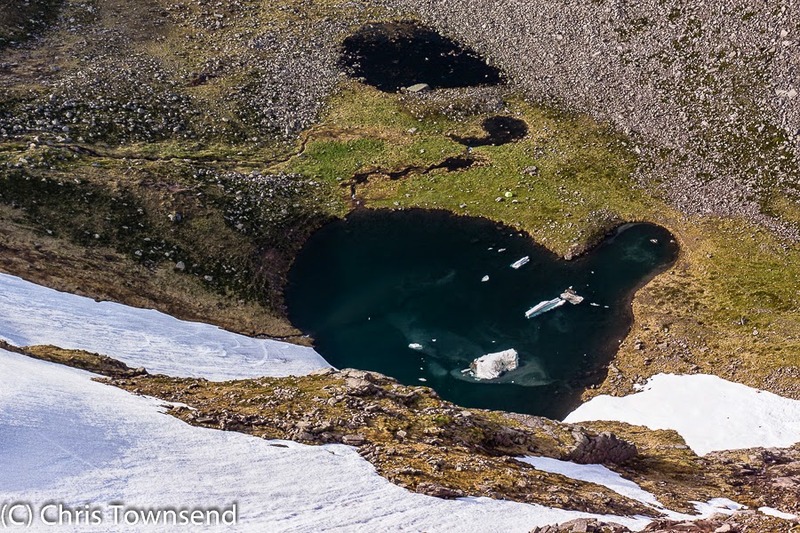 Whilst there is usually a little snow left in June this year there is far more than normal, the remnants of the extremely heavy snow falls of the last winter. Plateaus and ridges are mostly snow free and any patches can be easily circumvented. 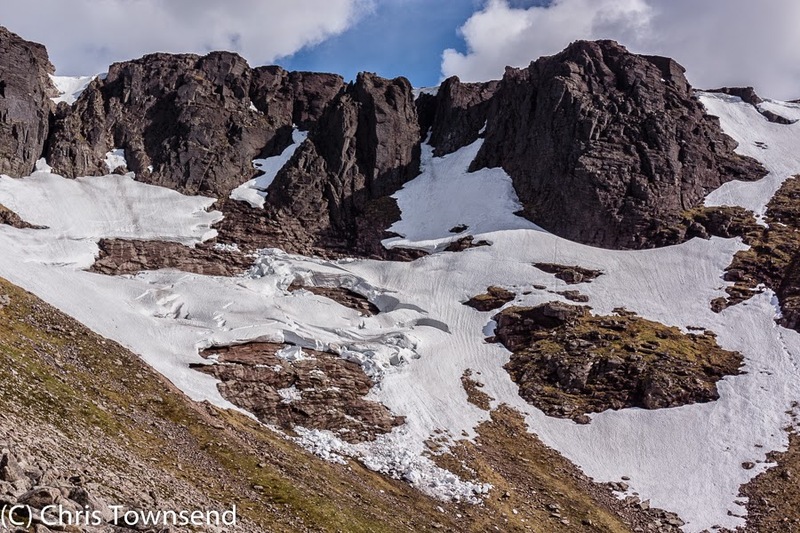 However many gullies, corries and steep north and east facing slopes still have much snow and some summer walking routes are still hazardous. 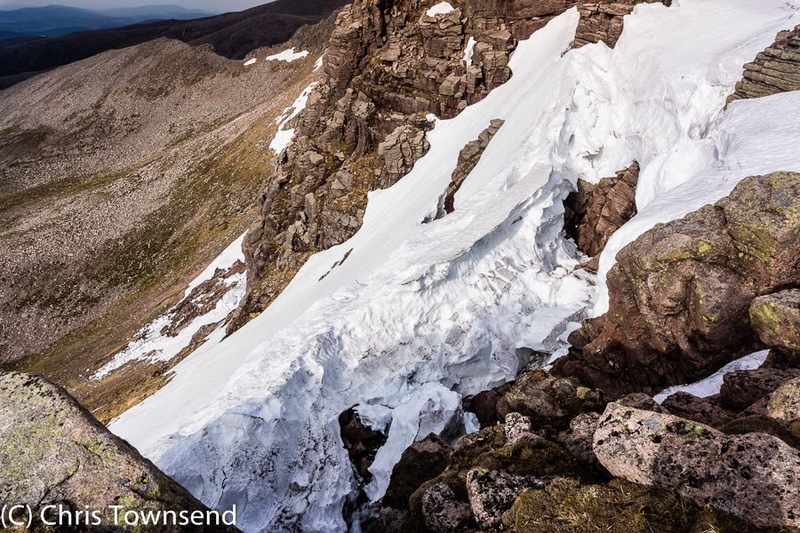 A few days ago I wandered into the Northern Cairngorms to see how much snow remained. 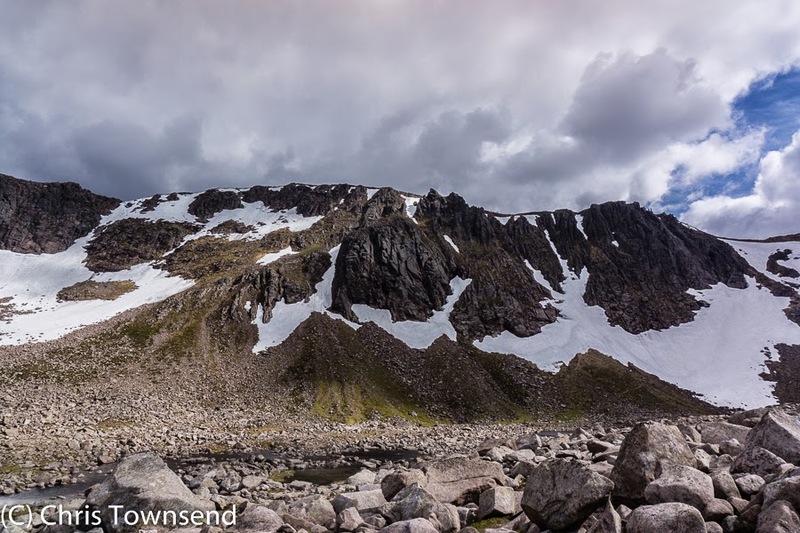 Initially I went into Coire an t-Sneachda where there was much snow in the gullies and on the headwall. The Goat Track, an excellent steep route up the back of the corrie, was still mostly buried. 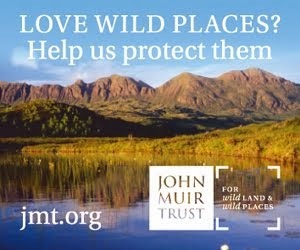 I wouldn’t risk it without an ice axe at present. Next I had a look into Coire Lochain and was astonished. 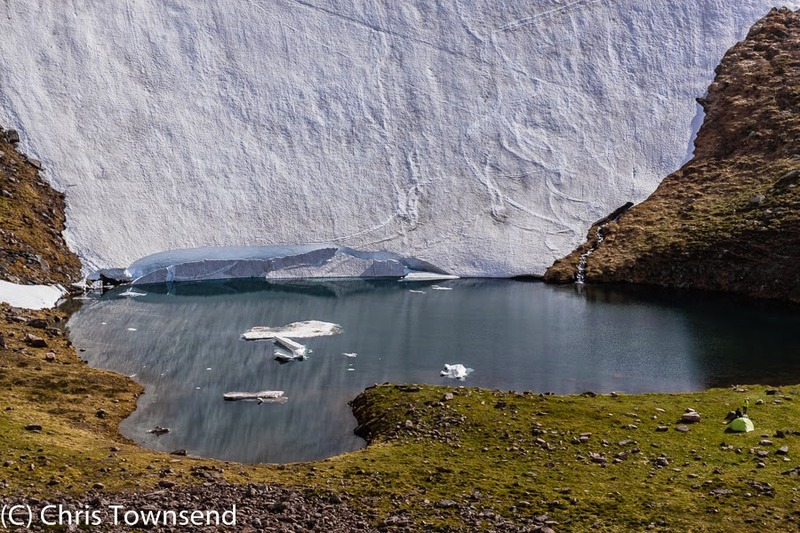 The west wall of the corrie was one huge sheet of snow that ran right down into the lochan itself. 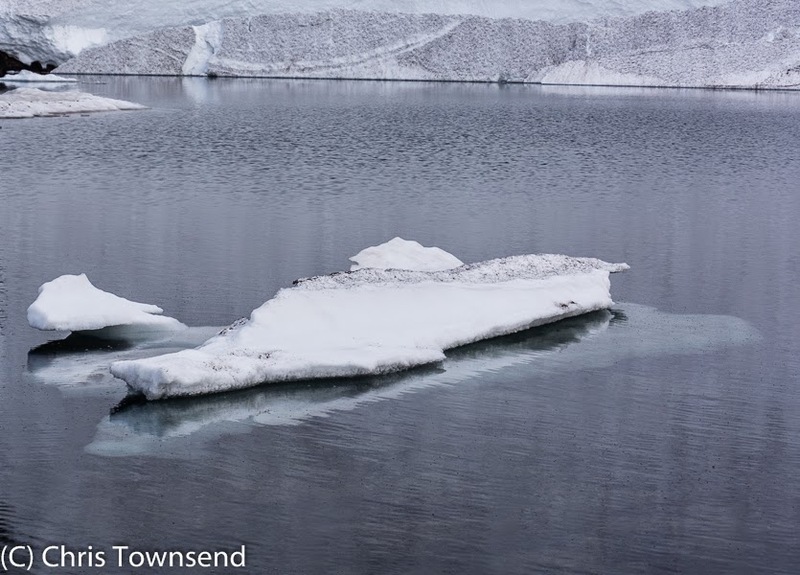 Here the end of the snow fractured, calving off small icebergs that floated in the water. A couple were camped nearby, giving scale to the scene. This is a splendid camp site at any time. In these conditions it was spectacular and I envied them. Beyond the lochan the cliffs at the head of the corrie were still streaked with snow whilst broken and cracked deep drifts lay on the notoriously avalanche-prone Great Slab. Picking out the shortest section of snow high on the west wall of the corrie I climbed the steep wet and slippery grassy slopes below it and then kicked steps up to the top. The snow was surprisingly hard and certainly a test for my trail shoes. It was only a hundred feet or so but my toes were sore by the time I’d climbed it. Continuing on to Cairn Lochan itself there were dramatic views down the cliffs to the tiny lochan far below. 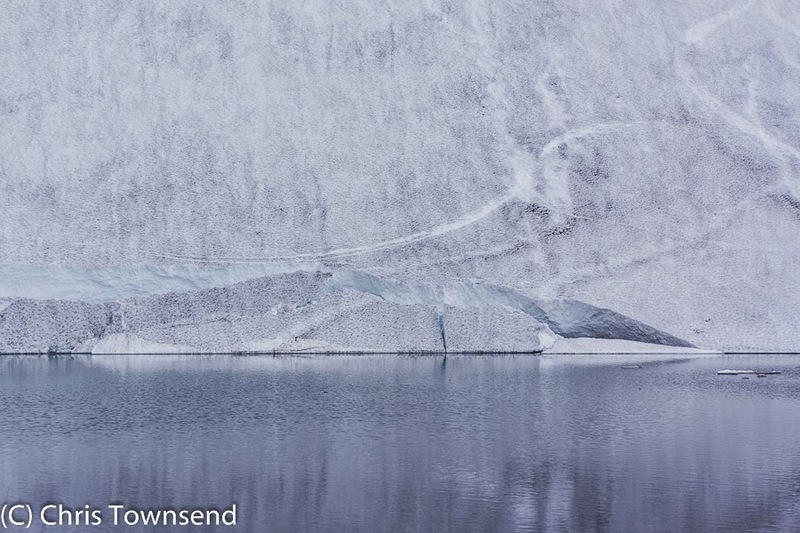 The gullies were still packed with snow – I estimated the top of the drifts as 10-15 feet deep – but this had peeled away from the top of the rocks. Looking across the Cairngorm Plateau I could see many big snowfields but nothing that would impede summer walkers. I didn’t cross snow once as I traversed Cairn Lochan and Stob Coire an t-Sneachda before descending down the Fiacaill a’Choire Chais. Coire an t-Sneachda, (corrie of the snow) seems quite appropriate just now. Very observant those early highlanders, where's all this climate change then? Hardly enough evidence to question climate change. You wouldn't pick a clean spot on a muddy football and deny the fact that it's a muddy football now would you? Actually what the amount of snow shows is how much fell in January, February and early March. From mid March onwards the weather has been pretty mild yet there's still snow left. 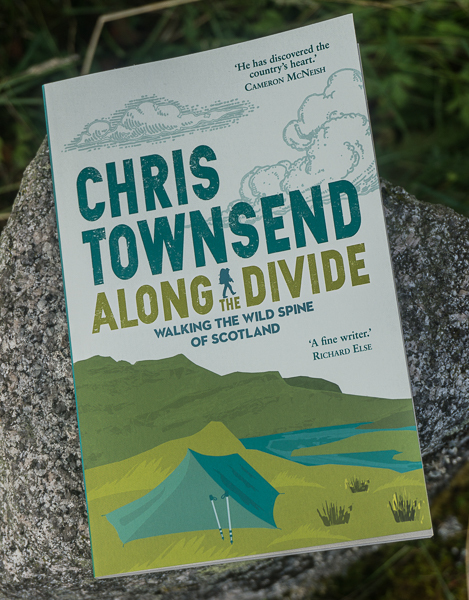 This last winter was odd in the Cairngorms in that whilst it snowed heavily above 600 metres below that altitude there was less snow than I've seen in the 25 years I've lived here. There was never enough to ski from the front door once, the first year that's happened. Temperatures were mild down in the glens too. You won't need an ice axe unless there's a big snowfall by next week, which is very unlikely. There's much less snow now than there was in June.